The Great Horned Owl (Bubo virginianus) is a magnificent night predator whose "hooting" calls have sent shivers down the spines of many. 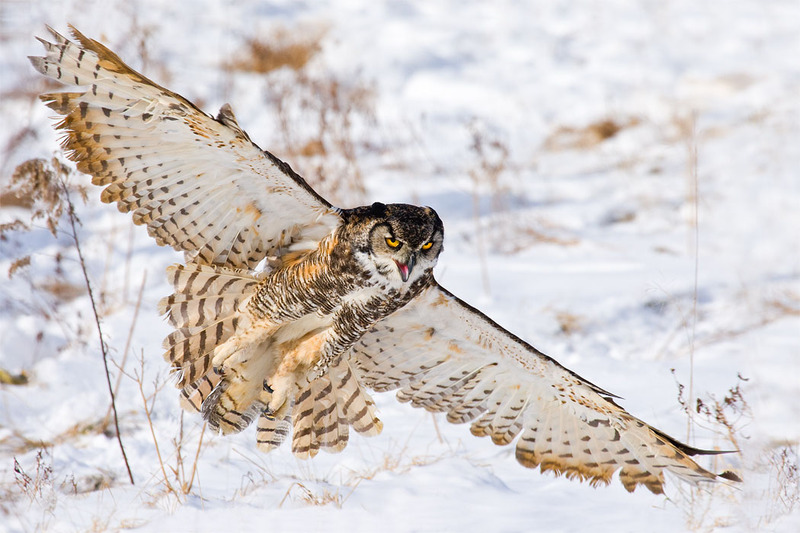 Easily identified by their distinctive horn-like feathered tufts, called plumicorns, these owls are known to inhabit from the Arctic to South America. The pale gray variety are found in Canada. This marvelous capture was taken in southern Ontario; a rare shot of this nighttime hunter still in predatory pursuit just as the day was beginning. Completely unaffected by the subzero temperature, he effortlessly pursued his target. With devastating strength, he could easily carry off prey several times his own weight. This morning, however, he returned to his nest empty-taloned.